What Is Back Pain? What Causes Back Pain? Back pain is a very common complaint. According to the Mayo Clinic, USA, approximately 80% of all Americans will have low back pain at least once in their lives. Back pain is a common reason for absence from work, or visiting the doctor’s. According to the NHS (National Health Service), UK, back pain is the largest cause of work-related absence in the United Kingdom. Although back pain may be painful and uncomfortable, it is not usually serious. Even though back pain can affect people of any age, it is significantly more common among adults aged between 35 and 55 years. Experts say that back pain is associated with the way our bones, muscles and ligaments in our backs work together. Recent surgical advancements have focused on performing surgery through smaller incisions, with less disruption to surrounding soft-tissues. The idea behind minimally invasive surgery is to perform the same treatment without damage to normal surrounding tissues. The drawback of minimally invasive surgery is that sometimes the underlying problem may not be adequately addressed because of an inability to get to the problem. Whenever a new minimally invasive procedure is introduced, there is almost always controversy as to whether or not the procedure is as good as traditional surgery. Endoscopic spine surgery uses specialized video equipment inserted through small incisions to see the structures of the spine. Similar to arthroscopic surgery of a joint, endoscopic surgery has advanced over the past decade from merely being able to look to the area of interest, to the ability to repair and reconstruct a variety of complex problems.The benefit of endoscopic spine surgery is the potential to address problems through very small incisions. By not damaging the muscles around the spine, recovery can often be much faster than with a larger surgical exposure. All of these micro-surgeries are variations of standard surgeries used to take pressure off of the nerves around the spinal cord. Traditionally done through larger incisions, the micro procedures use smaller incisions and specialized surgical instruments to accomplish the same goals of traditional surgery.There is no rule on where the line between traditional surgery and micro surgery is drawn. To some doctors this means a smaller incision, to others it means the use of special surgical instruments. Many variations of a procedure could be considered micro surgery. Laser spine surgery is a technique that uses a laser to remove damaged tissues. Because a laser can be inserted through small incisions, it can be used to cut away damaged tissues (such as disc fragments) without having to make a large incision.There is significant controversy about laser spine surgery as this technique has not been shown to have significant benefits, despite advertising that may make you think otherwise. Often marketed in magazines and the Internet, laser spine surgery has become the focus of some lawsuits formisleading patients about expected results from surgery. Is minimally invasive surgery better? There are many ways to answer this question. The bottom line is that we simply do not know. There are theoretic advantages, and there are possible downsides. But there are very few studies that compare the possible risks with the potential benefits of minimally invasive surgery.The bottom line I suggest is to find a surgeon who, above all, is interested in fixing your problem, not someone who is selling you on a smaller incision. If the same benefit can be achieved without damage to normal tissues, then minimally invasive surgery may be a good option. Mathews HH and Long BH “Minimally Invasive Techniques for the Treatment of Intervertebral Disk Herniation” J. Am. Acad. Orthop. Surg., March/April 2002; 10: 80 – 85. Adult Stem Cell Therapy that doesn’t require FDA approval to treat lumbar and cervical spine conditions resulting from injury or aging, and is also involved with an FDA clinical trial investigating the use of Adult Stem Cells. These stem cells are autologous – they are taken from an adult patient and returned to that same patient in a concentrated form to the damaged area in a 30-minute procedure. This type of adult stem cell therapy does not require FDA approval to administer. When it comes to stem cells, there is often a lot of mystique surrounding them. We hear from the media that we can create a human being out of a bundle of cells, which is not necessarily true. 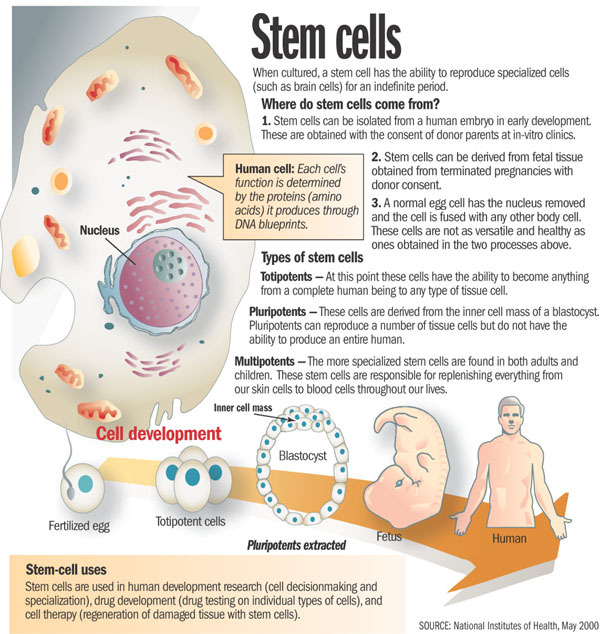 We also tend to look at embryonic stem cells as being the only type of stem cell. With these types of embryonic stem cells, one idea is to be able to create a liver or kidney in a Petri dish, which is not controllable or feasible at this point, and the work being done by the BecomePainFree.com medical group. When we look at stem cell types, we have embryonic stem cells on one hand and adult stem cells on the other. The characteristics of each of these are not like other cells. For instance, a liver cell can divide but it will only ever be a liver cell. These stem cells, both embryonic and adult, can turn into different types of cells. The embryonic stem cells can really turn into any cell type, but adult stem cells are limited as far as the cells they can turn into. This depends upon environment or niche and what they are already programmed to become. A lot of people think there is a lot of promise with embryonic stem cells and there is, although we are not quite there yet. We are still at the forefront of stem cell technology and embryonic stem cells in particular. With those cells, we do not have the ability to control what types of tissue they turn into. For example, we could be trying to manipulate these cells to turn into kidneys, but they might start to develop as pancreatic cells, which is troublesome. Another key with all stem cells is that they can proliferate quite a bit, usually at a higher rate than just a regular somatic cell. Although this sounds good at first glance, the issue with this, particularly with embryonic stem cells, is we cannot control that division. Hence, these cells can keep going and going without dying. In the normal bodily process, cells are programmed to die after a certain time, but these embryonic stem cells can evade that action and continue dividing, which takes on the characteristic of cancer cells. In some animal studies, an issue that keeps arising is development of tumors in some of these animals. It is difficult to predict if tumors are going to form when using some sort of embryonic stem cell treatment. This is still a scary area through which we are still trying to navigate. However, the focus of the BecomePainFree.com medical group is on adult mesenchymal stem cells. On the whole, the media does not give a lot of attention to these kinds of stem cells, as using them avoids any kind of ethical or controversial issues. There is a great amount of research being done on adult mesenchymal stem cells, however, because they are very powerful. First off, we can control what cell type they turn into much more easily. For example, the treatment used by the BecomePainFree.com medical group focuses on Mesenchymal precursor cells (MPC). Mesenchymal means these cells are not going to turn into any kind of blood product such as a red blood cell or white blood cell, although they are derived from bone marrow. The fact that they are precursor cells means these MPCs are only going to differentiate into one of a few cell types. They are either going to become bone cells, i.e., osteoblasts, or chondrocytes, i.e., cartilaginous tissue such that we see in intervertebral discs and joints, etc. All of that really depends on the environment in which we place these adult stem cells where it is well suited to do this. For example, we can inject these MPCs into a bone fracture, and because the cells are surrounded by bone tissue, these cells will receive signals from the surrounding cells that tell them to turn into bone. However, the cells we use will be injected into a disc or joint, and the cells composing the disc and joint tissue will signal the stem cells to develop into similar tissue. Again, there is no chance of any sort of pancreatic cell or nerve cell type spontaneously forming because we are using certain adult stem cell types, which are limited and cannot turn into anything like that. In addition, as the tissue surrounding the disc and joint is relatively avascular, there is not really any worry of these cells migrating through the blood stream to somewhere else in the body and causing any sort of problem. As far as the proliferation issue with embryonic stem cells, we have not seen this issue with adult stem cells in terms of dividing exponentially without ceasing. There is almost a preset limit to how many times these adult stem cells will divide.